Raspberry Smoothie You Will Love! Some days I get up and don’t feel like eating anything until lunch or dinner when I have a huge raw vegan salad. But on some days, and today is definitely one of those, I crave smoothies from early morning. On such days I end up having plenty of smoothies all day long, and that especially is the case when I have a huge batch of fresh fruits and berries on my hands, and this time it is a whole huge box of farmers market raspberries! 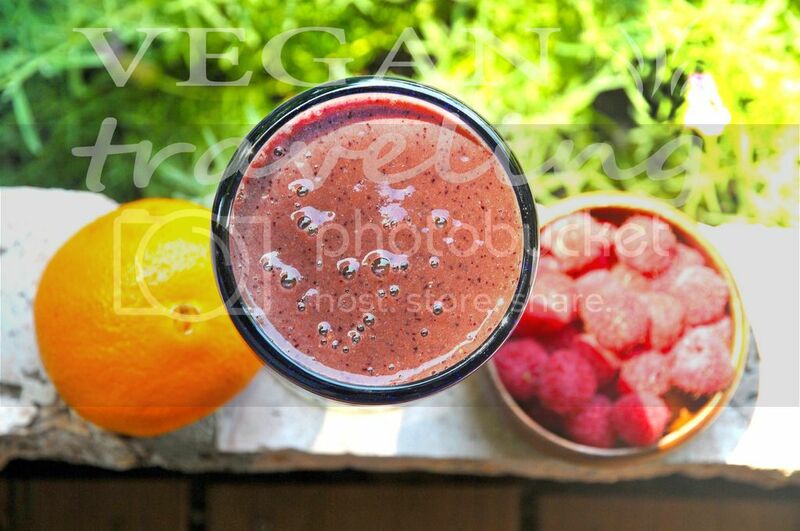 So I whipped up this awesomely creamy delicious raspberry smoothie in seconds and was enjoying it on our sunny deck…mmmm…Summer is sooooo good! 😀 Eventually this day turned out to be a mono-fruit and raspberry smoothie blend 🙂 Which to me, honestly, is the best and lightest way to eat, especially when I feel like I need a detox day. Blend it all up in Vitamix. Amazing how you won’t even feel the flax seed oil, but will nevertheless consume this wonderful source of omega-3s in such enjoyable raspberry way! Previous PostPrevious Juicy Tangy Mango Salsa! Next PostNext Backyard Garden Update!